Competing in the race of leading mobile phones manufacturing company in the worldMicromax mobiles has launched a new updated version of their previously launched A11Q as “Micromax A110Q Canvas 2” in the Indian market. This new handset joins the most prodigious ranges of Smartphones series of Canvas introduced by the company. Micromax mobiles is well-known for it’s high end configuration devices available at an affordable price range in the global market. In past few weeks, we have witnessed many cheap quad core powered devices in the affordable price segment by some of the well known manufacturer’s in India like karbonn, lava, xolo and many more. Though, we all are familiar with Micromax A116 Canvas HD in a quad core segment but due to it’s price hike in the recent past weeks with this device exists the the affordable tag range of Smartphones and joins the mid-price range segment. 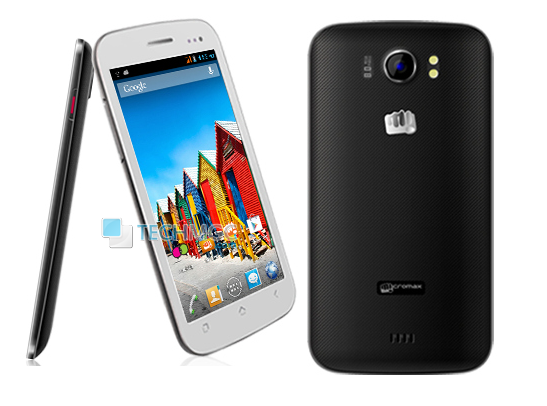 So here we have little cheaper Quad – Core device as Micromax 110Q Plus. Let’s see what Micromax has deliver in this newly launched device, Micromax A110Q Canvas 2 flaunts 5 inch of IPS Touch Screen display with 854 x 480 of pixels resolution. However, it is little disappointing to see the resolution, atleast qHD was expected in such kind of device. Dealing with it’s Platform dependency, this device sails on Android 4.2.1 Jelly Bean operating system powered with a MediaTek MT6589 quad core processor at a clock speed of 1.2 GHz. Dual Sim with Dual Standby technology, which is supported by almost every devices whether it could be a smartphone, tablet or phablet. This device also support the same Dual Sim (GSM+GSM) technology with Dual Standby. In terms of Storage specifications, Micromax Canvas A110Q Canvas 2 is equipped with 1GB of RAM, 4GB of Internal memory which can be easily expanded up to 32GB via microSD card slot. Enumerating it’s Photography Specification, this device has been offered with both the primary and secondary snapper options. On it’s back, it include a primary camera with Dual LED flash technology which enable the user to click a nice collection of snapshots in low vision. It also supports 720p of video recording. On it’s front, it supports a front facing camera rated at 2MEGAPIXEL for video chatting. Briefing it’s Connectivity support, this device supports 3G, WiFi 802.11 b/g/n, Bluetooth 4.0, GPS/A-GPS, FM Radio and a 3.5 mm Audio jack. To keep this device charged up, it has been equipped with 2000 mAh of battery. The price of Micromax A110Q Canvas 2 is Rs 12,100 and is available for sale on all the online retailers across the nation. Japanese Multinational Photography and Imaging Company,"Fujifilm Holdings Corporation"